hbl - great post and excellent diagrams - thanks! Between you and rsj it seems there is a decent account on endogeneity being fleshed out. This is essential stuff. I do think you're slightly unfair/misleading to say QE had no effect by focussing on the level of deposits: I believe QE explicitly aimed at managing down the yield curve further out. That objective can only be evaluated against the counterfactual of where the yield curve would have been otherwise. But obviously I agree with you, ultimately, that long rates are entirely driven by market expectations on (a) where CPI will print and (b) where the CB will set O/N rates in response - so yes, QE was an utter waste of time! Whilst I agree with the hypothesis that the non-bank private sector effectively has full control over the level of deposits, I am inclined to put it differently from a top-down perspective. 0. The non-bank private sector starts out with the level of deposits it wants; this could be described as a rough equilibrium. 1. The govt (but not the banking sector!) has the power to disturb this equilibrium, by net injecting deposits from the non-bank private sector (let's disregard net withdrawing deposits for now). It does this by unsterilised deficit spending (incl QE). 2. Non-banks will try to return to 'equilibrium' by getting rid of the excess deposits. There are two ways that a non-bank has to create(destroy) deposits: either (a) borrowing(repaying) bank loans or (b) selling(buying) a security to/from a bank. 2(a) divides into two types of activity, which are economically the same: the bank loan can be one's own, or someone else's. The latter category is obviously the corporate bond-for-loan refinancing. For me, it's more relevant to focus on the non-banks who have chosen to put their deposits into bond funds, than the borrower who is deciding to do the bond-for-loan refi; this latter decision is a simple function of the non-bank bond fund offering better rates than banks. 2(b) also divides into two categories, as the securities sold by a bank to a non-bank can be either someone else's, or else securities in the bank itself - they both have the same impact on deposits as they are settled by debiting deposits. Yes, in this post I focused only on the quantity effects of QE and not the price / interest rate effects. It wasn't intended as a comprehensive analysis of QE. I probably should have said so in the post, but as I've noted elsewhere, I'm in the camp that thinks that QE likely had little to no impact on interest rates. While I certainly don't subscribe to the strong efficient market hypothesis, I do think that the Fed's bid for treasuries prompted significantly more offers for sale of treasuries than would have otherwise occurred. I think the rate effect all roughly washes out to the crude general consensus on future inflation and Fed funds rate settings, as you say. As to your top-down summary, it makes sense to me, and I think it's all consistent with what I've said? (Perhaps you said it more clearly for a newcomer to the discussion :) The only thing I'm not clear on is what you meant by "securities in the bank itself" in the last paragraph? I had previously focused on (b) when comparing to total borrowing trends in the Z.1, but was that an error on my part? It turns out that the trends for the two have been quite different recently, with (a) growing erratically and (b) contracting to varying degrees. So, are all "securities in bank credit" that get added to a bank's balance sheet likely to be matched by an increase in deposits on the liability side? That question seems key to answering which data set I should really be using. hbl - I think my top-down summary is entirely consistent with yours. I like to start top-down because that way it's easier to be sure that you have fully covered all the various methods of neutralising govt/CB deposit injections. "Securities in bank credit" is an odd term, but it has to cover all securities held on a non-trading basis (ie Hold-to-Maturity/HTM). This will be mainly bonds but some associated derivatives, and will extend across public govt, ABS (ie securitised loans) or corporate. You ask whether bonds on banks’ balance sheets are likely to be offset by deposits. Good question. If a bank buys a bond in its trading book, this would not create a deposit since it’s a secondary market transaction. If a bank underwrites a bond issue, this is a primary market transaction and so it will create deposits – but these bonds should normally vanish immediately from the bank’s balance sheet since they will be sold to non-banks. However, if a bank makes a loan (with an offsetting deposit) which it then repackages in bond form (ie securitisation), the initial loan would create the deposits, not the repackaging. I’m not sure what conclusions one should draw from looking at trends in banks’ HTM bond holdings over time. Perhaps all the stuff in this category is from old busted securitisations, including the super-senior ex-AAA tranches of CDOs, which were to be held because the non-bank buyers of CDO tranches were mainly interested in the more junior tranches. The focus for borrowing is I think "Loans and leases in bank credit". The fact that one is going up whilst the other is going down highlights the bond-for-loan refinancing theme. Another point: along with the account of endogeneity, it would be helpful to have a better sense of what does move broad money up and down. You acknowledge that it’s a tricky area, as you say that MZM “generally expands during economic growth, but perhaps also during times of uncertainty”. Have you seen any attempts to analyse this a bit further? If we are comfortable that non-banks’ ability to ‘neutralise’ the excess deposits from govt/CB takes place quite quickly, presumably we should be able to look at the data to draw some more specific conclusions. I’m particularly minded of the cases flagged by Congdon (discussed on your last thread) of dramatic increases in broad money – eg UK financial institutions’ liquid assets basically doubled between 1973 and 1974. I don’t buy Congdon’s story, but I think it does provide a challenge for endogenous fans. Thanks for the explanation of "securities in bank credit"! Based on what you say, and the fact that this bucket includes both loans held to maturity and other assets held to maturity, it does seem like the H.8 data may not be a perfect source for total bank lending. I just took another look at the Z.1 and am wondering whether I can extract the appropriate data from the F.4 table (Credit Market Borrowing by Instrument). There is a "bank loans not elsewhere classified" line but once again I'm not sure there's a clear distinction in the F.4 between total bank loan liabilities (what is "elsewhere"??) and total other debt liabilities excluding federal government. I will have to research this further and see what I can make of it. One thing I have considered that might exert a strong influence on money supply is real short term interest rates, though I neglected to mention that example in the post. When real rates go negative, it seems people might be more reluctant to hold zero duration assets, unless it is out of fear/uncertainty about the future. 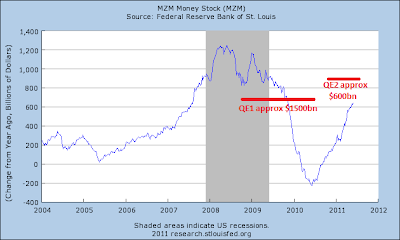 And the MZM do graphs show accelerating money supply growth from 2005 to 2008, with the Fed having progressively raised nominal rates during the first part of that time frame. 1. Higher than "expected" contraction of MZM growth in the late 1970s -- a sign of pessimism about inflation continuing to accelerate? 2. MZM growth seeming to accelerate into and through most recessions... perhaps the uncertainty and risk aversion factor? Not very scientific, I know. hbl - sorry if I was unclear, but whilst "Securities in bank credit" is definitely inappropriate, I think "Loans and leases in bank credit" is in fact exactly what you need. "bank loans not elsewhere classified" doesn't look that helpful to me. "When real rates go negative, it seems people might be more reluctant to hold zero duration assets, unless it is out of fear/uncertainty about the future" - interesting! This relationship would seem to be the opposite of what Volcker's gang were saying in the early 1980s - they were trying to target lower broad money by raising nominal (and hence also real) short-term rates, no? The more I reflect on this post, the more I think that endogeneity should be discussed in terms of where, within the private sector, the money injection by the govt/CB ends up (disregarding, as you do, banks acting as agents for non-bank parties). We can disregard money going to banks, as this is a straightforward increase in base money and has no material impact on deposits or lending (although it will change bank RoE as earning assets are replaced with lower-interest reserves). So if the money arrives as increased deposits at non-bank net borrowers, then they have a simple route to shed the excess deposits - repaying their own debt. This is basic - and it's what Kaldor seems to have focused on, perhaps too narrowly (although I haven't read him). (c) buying existing or new bank securities from banks (ie banks replacing deposits with bonds). 1. I think your comment "without [the private sector] having to alter its borrowing desires" isn't quite right, because a non-bank borrower may use the proceeds of QE to simply pay down its own debt. 2. Your diagram should look slightly different depending on which of the four scenarios we are in. I will drop you an email to illustrate what I think these look like. You were clear the first time, I just didn't feel content that "Loans and leases in bank credit" was ideal, since it might not represent the entirety of bank loans extended to the non-bank sector. However, in the absence of good data on the collective bank loan liabilities of the non-bank sector, it will probably have to do. (One approach measures assets, or at least a subset of them, and the other would measure the liabilities). A lot of this stuff conflicts with established "wisdom"! However there are so many overlapping dynamics in play, and Volcker's gang may have been successful during that particular time frame if raising rates dramatically enough choked off enough lending to negatively impact money supply growth and make that dynamic the dominant one. I'd have to spend more time on this as I don't know the history that well, and my previous thoughts were just initial speculation. Good comments. But regarding your point #1 at the end, I am focused on ways QE will cause the private sector to act differently than it would have otherwise. Households or businesses are always free to sell assets and receive deposits so that they can pay down debt. QE doesn't really drive that dynamic unless it relieves a macro level liquidity crunch... so maybe the initial months of QE1 were successful in that way (especially since the Fed bought illiquid housing-related securities in addition to treasuries). But I don't think this would have been a relevant dynamic during QE2. I should probably add a fifth method to the list, though it is very similar to #2 (in which QE causes the private sector to change its borrowing levels). 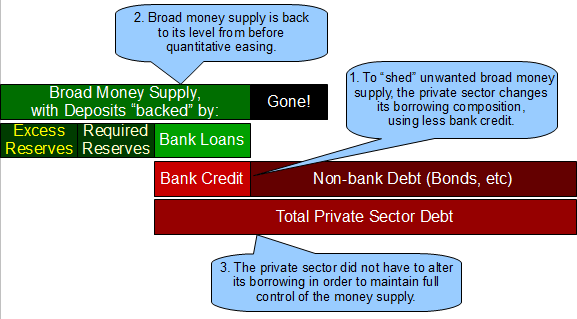 For this fifth method, it would be more that QE allows the private sector to succeed at the change in borrowing levels that it wants to achieve but lacks liquidity (at the macro level) to effect. On your point #2, I agree the diagram should look different for the different scenarios, and as I commented under method #1 in the post, the bulk of the post was about that scenario (including the diagram). I got your spreadsheet but am short of time to dig into it for now. Looks very meaty though... thanks! Will investigate later. I reviewed your spreadsheet. You did a nice job taking things to the next level of detail and attaching explicit visuals to the various scenarios! I can't upload spreadsheets to a blogger site (thoughtofferings) but if you want I could put it on a "hidden" subdirectory on econviz and link to it in comments here, in case anyone else tries to follow this conversation. In addition to splitting/labeling assets and liabilities more explicitly, you took the extra step of trying to identify whether action would be driven by net borrowers versus net lenders. I think it's an interesting exercise, though to me it doesn't seem necessary. There will be some crossover, e.g., a net borrower rather than net lender could at times drive your scenario #2a (e.g., adding to 401(k) which in turn includes bond assets that provide someone funding that out-competes the banking system's potential provision of that funding). So I think your separation adds depth to the scenarios and makes the "common case" easier to picture, but personally I like the simpler aggregation approach. But maybe I'm missing something. For your scenario #1, as I said before, I'm not seeing quite how that is relevant to the private sector shedding "excess" deposits as a result of QE. Would there be some way that a greater quantity of deposits would drive some to pay down debt more than they otherwise would have? 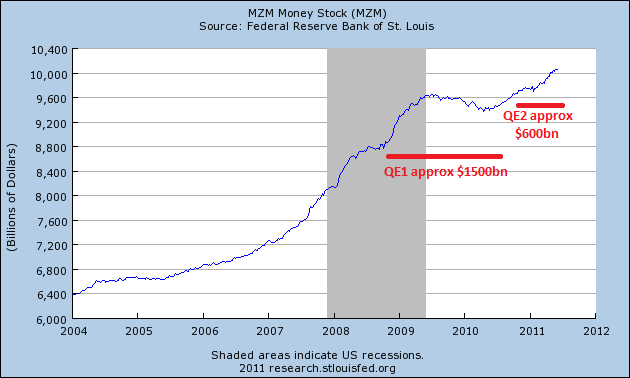 (i.e., without QE having added those deposits?). Otherwise the QE effect is just a layer on top of existing economic activity, some of which involves paying down debt when it makes sense. I think what makes "sense" might often be because an entity has increased its balance sheet equity by a certain amount. But increased balance sheet equity is different driver of behavior than having additional zero duration assets that have replaced long duration assets (the QE effect). 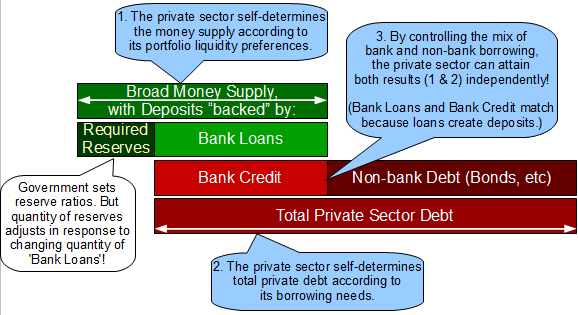 Perhaps there is a dynamic along these lines specifically in the financial sector in which there are all sorts of entities with a large mix of assets and liabilities, where a larger bid by non-banks to provide funding could somehow shift the desired mix of assets and liabilities and motivate a deleveraging. Maybe that's what you were getting at. But in the household and non-financial corporate sectors, borrowing needs are generally driven by non-financial-sphere motivations, so I'm not seeing how your scenario #1 would apply there. I realize you partly included it for historical reasons though since you mention others have argued that as a primary dynamic. So that is useful. And your #1 is very vaguely related to my scenario #2 (with the example I used being of cash buyers winning a larger proportion of home bids and pushing out some debt-funded buyers). In your #1, an entity LOWERS its bank loan liabilities because of QE. In my #2, an entity FAILS TO INCREASE its bank loan liability balance because of QE. Same macro outcome, different underlying mechanism. hbl - your comments are fair. I count your #2 "changing aggregated propensities to borrow" as a sub-division within my #1 ie private sector agents in aggregate reducing their own bank borrowings, but that said, your point is of critical importance in elaborating a key part of the endogeneity mechanism, and is certainly worth bringing out. I'm not trying to get hung up on taxonomy; my charts were as much to ensure my own understanding on the various mechanics your had outlined made sense. 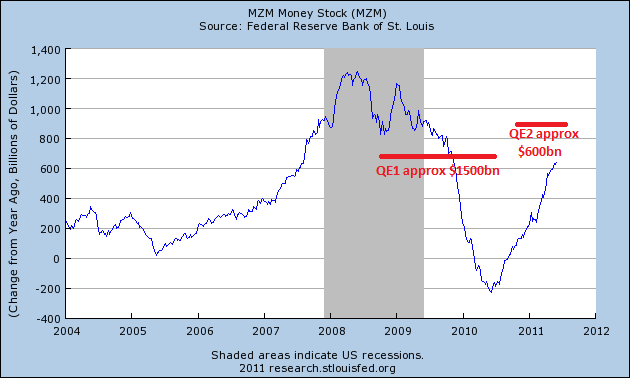 Your observations on my #1 are valid - its relevance to QE is as much historical and abstract. It's of more relevance if you want to generalise from QE to any situation of under-funded deficits (thinking of the MMTers who want to stop issuing any new govt debt). At the margin, if a govt goes into budget deficit by paying a tax credit to an indebted household, the mainstream, influenced by the 'broad money' school, will immediately claim that, because the deficit hasn't been sterilised by bond issuance, there will be "more money chasing the same amount of real goods", so inflationary pressures will be felt. But clearly in this case, there’s a good argument that the household will simply use the cash to repay some of its debt (depending on quite how heavily indebted it is, perhaps), so that the level of deposits returns to the previous level. 1. Increased balance sheet equity is a much more significant driver of behavior than "more money" with unchanged balance sheet equity. (QE falls in the latter category). 2. "Money" might not be spent -- it can either add to savings or be used to pay down debt, as you say. 3. Even if the money is spent, idle capacity can often mean increasing output without increasing prices. Thanks for the discussion (again). hbl – sorry if you were hoping to wind it up there, but may I frame / generalise things a little more? The challenge to endogenous money fans from the ‘broad money’ mainstream seems to be twofold: (a) to show what different mechanisms there are for the private non-bank sector to _potentially_ re-equilibrate without leading to inflation, and (b) to demonstrate the extent to which these mechanisms _will_ in practice kick in to obviate inflation. On (b), one could (maybe someone already has done) classify endogeneity as ‘hard’ or ‘soft’ depending on whether you think its mechanisms remove _necessarily_ all, or merely some, of an injection of deposits from the govt/CB. To my mind, you have now addressed (a) exhaustively (and well). As for (b), this is the point I think rsj was focussing on in his posts "pushing on a string" etc. He focussed on non-banks buying bonds, either from banks or from other non-banks – which ignores your #2. rsj began by claiming that the entire deposit injection would be unwound, although I think ultimately he concluded that these mechanisms (your #1, #3 and #4) would collectively reduce most of the non-banks’ excess deposits, but not all (with the proportion being dependent on the ratio between the relative sensitivities to yield of the desire to hold/issue bonds on the part of the non-bank and bank sectors). So in other words, he retreated from ‘hard’ to ‘soft’ endogeneity. That said, the relative sensitivities argument (although he didn’t comment on any theoretical or empirical way to quantify the ratio) provides comfort that a good majority of the excess deposits will be shed by the bonds / deposits mechanisms. If you add in your mechanism #2 (which rsj disregarded), you will find that a higher proportion of the deposit injection has been shedded. But do you get all the way to 100%? Perhaps (b) is simply still an open question. I do think it is important though, because if the apocalyptic figure of Austerity is ever to be repelled, and if people’s fear of bogus bond vigilantes is ever to be soothed, people are going to have to learn to get comfortable with the govt/CB potentially injecting further net deposits into the non-bank sector. LOL... yes, we can keep up the discussion if there is more to discuss! My short answer on (b) is that I think ALL of the injection can be undone by these mechanisms in theory, with the only limitations being real world institutional frictions and time lags. Frictions might include things like mismatches between who can borrow via bank loans versus non-bank loans (a point I think you raised on an earlier post?)... though the markets are so flexible (securitizations, peer to peer lending, etc) that I'm not convinced that these frictions actually amount to much. It would be great if the evidence for "hard" or "soft" endogeneity were conclusive, but clearly it's not. However, my read of the money supply charts I included leads me to think it looks more hard than soft. But that's a very subjective and imprecise conclusion. Regarding RSJ's latest post on supply and demand curves and the "excess demand function" for bonds... My experience has been that there are not a lot of places that supply and demand curves are accurate tools in macroeconomics (despite their place in microeconomics). The problem with them in macro is how immediate the dynamic feedback effects are at changing the curves themselves. For example the fallacy that the great depression could have been avoided if workers were willing to take a big enough pay cut -- when in reality falling pay feeds back directly into further falling demand and thus pay cuts themselves put no floor on GDP... it is an entirely separate mechanism (automatic stabilizers and other shifts in macro flows) that establishes the GDP floor. Post QE, I don't think the excess supply or demand for money/bonds/etc persists beyond the very short term, and thus I think it has no material impact on interest rates. Hence my perhaps overly bold conclusion in the post that, "economy-wide interest rates truly are anchored to the short term Fed Funds rate plus expectations of future rate settings." At the macro level, the effects are all relative, and the counterfactual is important. The private sector has a choice between bonds and money, the choice is not between bonds and nothing (the latter is what the "excess demand for bonds" charts imply to me). And then that choice is influenced by relative interest rates, not absolute ones. And given the endogeneity of the money supply, there never is a persistent "excess" supply of money or bonds that could drive interest rates away from some rough approximation of their mostly-Fed-policy-determined curve. Of course I could easily have something wrong here as RSJ clearly has a more advanced background in textbook economics than I do, and I know I am having trouble formulating a precise explanation of my intuitive reasoning. It is true that in the UK's experience, the money stock rose when there was high inflation during the 1970s. However this was due to high wage rise instead of being caused by the money supply itself. In the 1970s, there was a wage-price spiral which can be described as follows: Wages rose causing firms to increase prices since their costs increased. To pay more wages, firms also borrowed more from the banks. Since prices rose, workers demanded even higher wages to be compensated for the erosion of their wealth and this led firms to increase prices even more and borrow more from the banking system and hence increasing the money stock even more. I believe the UK government was also indexing wages for government workers. So the evil was wages not "money". You can read this in Basil Moore's work. "Economy-wide interest rates truly are anchored to the short term Fed Funds rate plus expectations of future rate settings. " While that is true, it is also dependent on portfolio preferences of the private sector, and Godley and Lavoie have attempted to show how expectations theory can be made consistent with the segmentation/preferred habitat theory. The Federal Reserve is actually using the fact that by removing supply of government bonds from the markets, it is reducing long term rates. Ben Bernanke mentioned this stock effect in the first press conference follwing the FOMC meet. Even Paul Krugman gives support to this argument by the Fed. (his "liquidity trap" arguments are somewhat different and make no nense, of course). "While that is true, it is also dependent on portfolio preferences of the private sector, and Godley and Lavoie have attempted to show how expectations theory can be made consistent with the segmentation/preferred habitat theory." I agree, and I think Anders and I covered some of this in comments above about what might influence the desired money supply size (one of my off-the-cuff examples was "fear about the future" which is just one part of expectations). But what is "segmentation/preferred habitat theory"? Is that in the G&L book you often recommend? "The Federal Reserve is actually using the fact that by removing supply of government bonds from the markets, it is reducing long term rates. Ben Bernanke mentioned this stock effect..."
One of the core points of my post is that there is no stock effect from QE that has any effect on the economy or interest rates. I believe the Federal Reserve papers etc that predicted a stock effect are wrong for the reasons I gave in this post. The only meaningful stock effect is the removal of interest income that previously was paid to the private sector from the government. There could be some meaningful flow effects (at least at a micro level) given the ways that QE prompts a shift in debt types and perhaps a changed bid for leveraged assets like housing, but I have not discussed those much in this post, and I don't think the common presumption that the flow effect might lower interest rates is correct. I can't tell from your comment... do you disagree with my conclusion that there are no stock effects? Are you agreeing with Bernanke and Krugman? I am not sure if you have talked of the stock effect, your post concentrated on the money supply. I don't think I agree with Bernanke and Krugman in general, but only specifically on this issue. Also, the Fed relied on the wealth effect and also tried to influence households to refinance their debt due to lower long term yields so that they consume the extra and this increases demand. And there could be other scenarios they may have thought of. The idea that QE did not reduce yields is not the best argument (people frequently do that) because we would have had to live through two worlds simultaneously to really prove. I can argue (without proof) that without QE yields may be been even higher etc. I discussed the money supply relative to the supply of long duration assets and both are all about shifts in the stocks of financial assets. I suppose I didn't explicitly connect it to the Federal Reserve's discussion of the "stock effect" via institutional portfolios, except for a brief mention. I guess the theory seems to me to indicate that there shouldn't be much stock effect given the portfolio shifts enabled by money supply endogeneity. As for the flow effect, I agree, there is no way to prove or disprove its existence. Ramanan - agree with your interpretation here on the 1970s UK. I am - influenced by you, I expect - fairly comfortable with a model of inflation hinging on market power (indexation, unionisation, and the classic - an insufficient output gap) rather than the quantity of deposits, which is best seen as an effect, not a cause, of inflation. But the thing is, at what point do hbl's mechanisms slow down and stop working, such that the extra deposits get channelled into aggregate demand instead of paying down bank debt? Since private sector credit is substantially larger than 10% of GDP wherever you look (particularly on a gross basis), there would seem to be plenty of scope to run a large, fully unfunded/monetised budget deficit for a few years without the deposits going to increase aggregate demand. But at some point, I can't help thinking that inflationary pressures would eventually start to build. But when? Does one need to posit a utility function for the private sector around the desired level of credit vs aggregate demand?